Could I assemble a pizza in under a minute? Sure. Would it look like Jackson Pollock had suddenly adopted pepperoni and marinara as his medium? Yes. 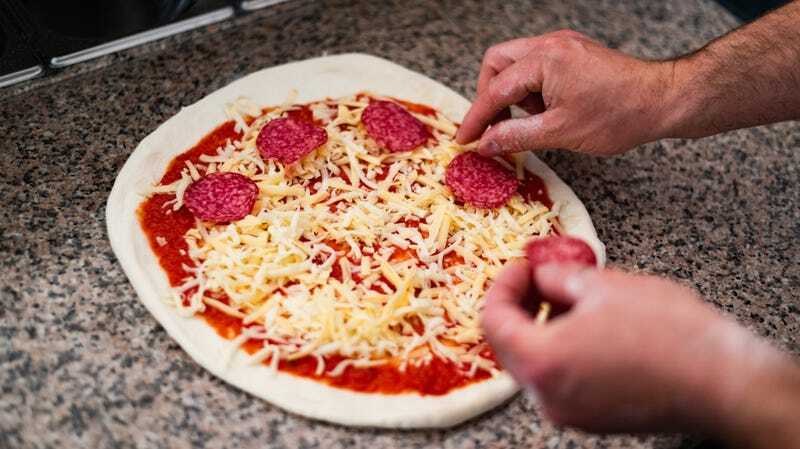 So the news that a Maryville, Tennessee man not only assembled a pepperoni pizza in 48 seconds but did so while maintaining strict aesthetic standards deserves our admiration, applause, and attention. WBIR reports the man, Kevin Astling, is an employee of Marco’s Pizza, which held a national competition to determine the “fastest, most accurate” pizza-builder. Ohio-based Marco’s has more than 900 locations from which it drew its competitors. Astling left the rest of the field in the dust by assembling his pie fastest—the second-place pie-maker came in at 53 seconds—while still adhering to Marco’s strict specifications including proper sauce-to-crust diameter; consistent dough thickness throughout the pie; specific proportions of the three-cheese blend; and precise pepperoni placement. Other pizza chains including Domino’s also profess to employ their own “fastest pizza makers,” though it’s unclear whether their lightning-speed pies are evaluated on such exacting aesthetic criteria. For his efforts, Astling receives a trophy, a $1,000 prize, and hopefully a memoir deal and/or appearance on Ellen. If someone can dig up video footage of this competition, you will earn a comment star and my eternal gratitude.